PARIS -- Charlie Hebdo's defiant new issue sold out before dawn around Paris, and still people were lining up at kiosks in case of a spare copy of the paper fronting the Prophet Muhammad. The core of the irreverent newspaper's staff perished a week ago when Islamic extremists linked to al Qaeda's Yemen branch stormed its offices, killing 12. Those who survived put out the issue that appeared on newsstands Wednesday, working out of borrowed offices, with a print run of 3 million -- more than 50 times the usual circulation. As the newspapers went on sale, a new video statement released by al Qaeda in the Arabian Peninsula (AQAP) claimed the group had planned and funded the attack as revenge for the publication of images of the Prophet. One newsstand just off Paris' Champs Elysee sold out at 6:05 a.m. -- five minutes after opening. At Saint-Lazare, people hoping to buy a copy scuffled when they realized there weren't enough to go around. Charlie Hebdo announced that it would print an additional 2 million copies of the latest edition for distribution by Thursday to meet the huge demand, reports CBS News' Elizabeth Palmer. Copies of the paper were already getting bids Wednesday morning on eBay into the hundreds of dollars. The newspaper appeared as France's government prepared strict new anti-terror measures, and as the search continued for as many as six people thought to be linked to the suspects, French-Algerian brothers Said and Cherif Kouachi, who were killed on Friday in a police raid on a business northeast of Paris. Many Muslims believe their faith forbids depictions of the prophet, and reacted with dismay - and occasionally anger - to the latest cover image. 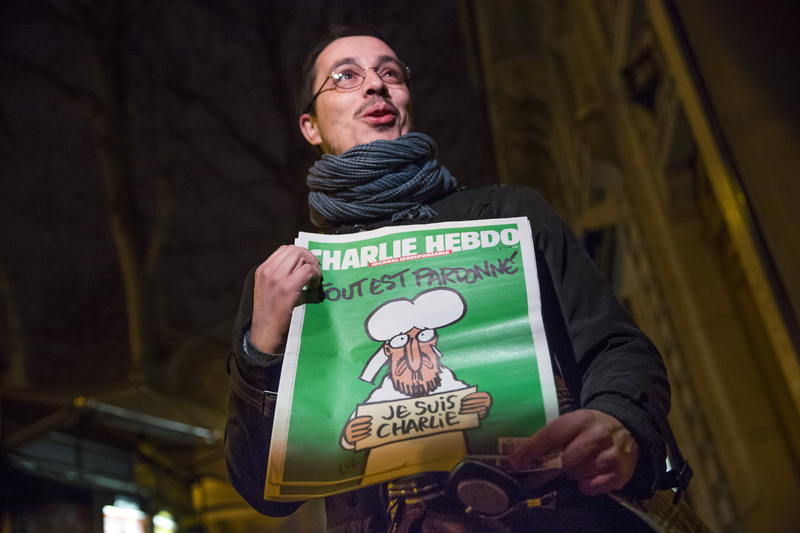 Some felt their expressions of solidarity with Charlie Hebdo after last week's attack had been rebuffed, while others feared the cartoon would trigger yet more violence. The paper printed a four-page selection of cartoons and articles - including caricatures of Pope Francis and French President Francois Hollande - but left out cartoons likely to offend Muslims. However, two Cumhuriyet columnists used small, black-and-white images of the new Charlie Hebdo cover as their column headers. "This is all I'm doing today!" said Ami Patel, owner of the Around the World magazine and book store near Times Square - one of the city's biggest purveyors of foreign publications.